AHCA will offer a Buy In Option for the 2016 National Finals. Many members aren’t able to qualify for Nationals due to a lack of affiliates near them. Where there is no affiliate within 200 miles of the membership address the member will have the opportunity to buy into Nationals. 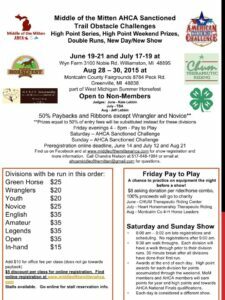 The fee for the first horse to compete would be $150. Every additional horse or additional entry after the first one would be an $25. This fee would be in addition to the regular entry fee. A charter or lifetime member will be entitled to bring one entry to Nationals annually without qualifying that horse or paying the buy in fee. They would still have to pay the regular entry fee. All results can be found under the 2014 Nationals tab. Nationals is almost here. Get your entries in. There will be many great prizes. In addition to Cash, Saddles, and Buckles, check out the many sponsors who have donated to awards this year. AHCA is also sponsoring a fun Costume Class on Saturday evening after that day’s competition. This year’s Nationals should prove to be the best yet. Thank You to all who are working so hard to make this year’s event a Great One! Check out the event page. K Cross Ranch in Energy, TX and Red River Horsemen in Linden, TX are hosting events this weekend to help members get qualified for Nationals. This will be your last chance to qualify for or tune up prior to Nationals.